Upon arrival at the Ministro Pistarini (Buenos Aires International Airport) you will be assisted for your connecting domestic private flight to San Martin de los Andes, located in the Lake District region in Northern Patagonia. Upon arrival, private transfer to your lodge, conveniently located 10 minutes from the Airport. Estimated flying time from Buenos Aires to San Martin de los Andes: 2 hours 50 minutes. Tipiliuke is a special spot at the foot of the Andes mountain range, in the middle of Lake District – Patagonia, just a few kilometers from the city of San Martín de los Andes (10 min. drive from Chapelco airport) where you can enjoy the diversity of fly fishing and other outside tailor made activities year-round as well as authentic refined country-style cuisine and knowledgeable personalized assistance. Tipiliuke is part of the 20,000 hectare Cerro de los Pinos Country Estate, founded in 1909 by the grandfather of the current owners. Since it is still a fully working farm, guests can participate in harnessing the animals and take part in other rural tasks with the farm workers, or just relax in the beautiful surroundings. The lodge conjures up a selected spot for wildlife and flora observation. Since it is a working farm (estancia) with 4.000 head of cattle, guests can share horse and cattle activities. The ranch buildings are very beautiful and unique in their style, including the lodge, the old barns, the chapel and several family houses. This tree sanctuary, unique in the province due to its size and wide diversity of tree species, is a magic place as is the 6 hectare tree nursery surrounded by the crystalline waters of the Chimehuin and Quilquihue rivers. Tipiliuke is located in the heart of the property. It has 9 bedrooms with private bathrooms, a living room, a dining room and a cozy bar. All these common areas have wi fi. During summer time guests enjoy outside lunch surrounded by elderly trees. The lodge is in the midst of a magical wooden area with a whispering stream nearby. There are about 200 species of different trees from all over the world, acquired and planted during three generations of the family. Fly-fishing rainbow and brown trouts is one of the main activities for guests during summer and autumn time. The property stretches 14 km (9 miles) along the Chimehuin river and 7 km (4.35 miles) along the Quilquihue river. Both are known worldwide for their fish and the magnificence of their waters. Everything is arranged for fly-fishing anglers to have an unforgettable stay including specialized guides, vehicles, outdoor lunches, etc. Fly-fishing season ranges from the beginning of November through the end of May thus covering spring, summer and fall. Fly-fishing is not included in the price. If you prefer to hiking, The 20.000 hectares/48,000 acres of the property offer endless trails to walk along. Some explore Mapuche ́s sites -ancient inhabitants of this mystical land. Other paths lead to different viewpoints from where you can appreciate snowcapped mountains, changing colors of the forests in spring and other Patagonian landscapes. One of the high points of the trek is to find different springs and see how the water emerges from the ground making everything green around them. Another option could be golf: Legendary Jack Nicklaus and his eldest son Jack Nicklaus II, worked well together to create this unique patagonian masterpiece. The 18-hole, par 72 course at Chapelco Golf Club delivers an experience that will thrill and enchant players of any skill level and is located only 20 minutes from the lodge. You can also enjoy some fantastic spa treatments and rejoice into a delicious malbec while admiring the breathtaking views all around. Today in the morning, you will be taken to the airport for your flight to El Calafate, located in Santa Cruz province. Upon arrival you’ll be transferred to your lodge, Eolo, with your personal guide. Estimated flying time from San Martin de los Andes to El Calafate: 2 hours 35 minutes. El Calafate is the entrance to the national park, where part of the continental ices are protected, declared World Heritage by Unesco. El Calafate is situated by Lake Argentino, a green water surface covering 1,600 km2 and has great mysterious depths, like all lakes originated from glaciers. It receives its name from the small bush calafate, indigenous of Patagonia. Its fruit is a delicious berry very good for the elaboration of jam. According to tradition, whoever eats calafate will return for more. 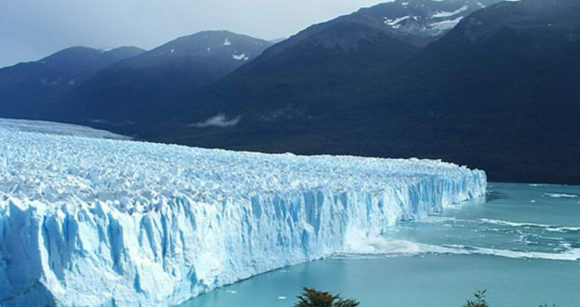 But reality indicates that whoever visits Calafate wants to stay there forever. It is an oasis of poplars, willows and pines at the border of the steppe. The near Glaciers National Park covers a surface of some 600,000 hectares with 47 glaciers, such as the Viedma, the Moyano, the Marconi, the Upsala, the Agassiz, the Bolado, the Onelli, the Peineta, the Spegazzini, the Mayo, the Ameghino, the Moreno and the Frías, all of them located within the Atlantic basin. Glaciers National Park, to enjoy a memorable day. Arrival to the port where you will take the boat that will cross over onto the ice field on top of the glacier. After a brief introduction, you will receive the instructions and special equipment to trek on ice. Trekking time is around 1h30mins. Among incredible blue and turquoise streams, small lagoons, gullies, cravasses and plenty of ice formations, you will be part of one of the most amazing landscapes on Earth. After the ice trek, enjoy the spectacular catwalks and balconies facing the Perito Moreno Glacier are an amazing way of walking along and in front of this immense turquoise wall of ice and enjoy expansive and up-close view of this magnificent glacier. At the end of the day, return to your lodge, where you could try a short hike or horseback ride around the property. Today you will continue the trip to the Southernmost City on Earth: Ushuaia, located right next to the Beagle Channel. Estimated flying time from El Calafate to Ushuaia: 1 hour 15 minutes. Upon arrival a private chauffeur will be expecting you and will drive you to your lodging, Los Cauquenes. Located on the shores of the Beagle Channel with views of the Andes Mountains, this property was built using traditional regional architecture. The hotel offers a warm atmosphere, deluxe accommodations, a spa and wellness center, exclusive beach access and an excellent restaurant. Today you will be first taken to Estancia Harberton. Harberton is the oldest estancia (farm) in the Argentine sector of Tierra del Fuego. Declared an Argentine National Historical Monument in 1999, the estancia maintains its original simple buildings of wood covered with corrugated iron, its gardens, stone piers, and terraces. Originally operating with sheep (for wool), cattle (for meat), Harberton also had the first almacén (store) and imported supplies for all of southern Tierra del Fuego, as well as selling vegetables, meat and supplies to the gold miners of the era. Then you will navigate to the Penguin rookery at Martillo Island, the domain of the Magellanic Penguin and a small population of Gentoo Penguins. The unique location of this island (close to the point where the Atlantic and Pacific Ocean waters merge) allows for an incredible variety of rich subaquatic life, making it an amazing spot for birdwatching (petrels, skuas, cormorants, sea gulls and albatross). Today in the morning you will be picked up and taken to the local airport for your private flight to Trelew, in the Valdes Peninsula. Estimated flying time from Ushuaia to Trelew: 3 hours. Estimated driving time from Trelew to El Pedral: 1 hour 45 minutes (100km). Upon arrival you will be expected to be transferred to your lodging, El Pedral, which is located 100 km north of Trelew in Punta Ninfas. Thanks to its privileged location, El Pedral is an ideal spot to experience excellent fauna sights in exclusive contact with nature. A Norman style house of XIX century, protected from the strong winds by a dense grove of cypress and tamariscos, it offers the opportunity to experience the authentic life of Patagonian estancias. It retains the Patagonian atmosphere; rustic but still sophisticated; warm and friendly. Homemade meals make you feel at home. This is the ideal place to relax at the end of the day. It has 8 rooms, a Quincho and a swimming pool. Outside, the magnitude of Patagonia expresses herself. Everything in one place: whales, killer whales, penguins, sea elephants, sea lions. Its beaches, which are easy to reach, have been chosen by the sea lions and elephants to establish their colonies. Moreover, since 2009 a penguin rockery is growing year after year. The first 14 adventurous couples nested in the southern coasts, where the cliffs start. Next year, the rockery reached the 85 nests, and it is expected to continue growing. This is why the area has now been protected and declared the “Punta Ninfas Wildlife Natural Shelter “. Penguins can be seen from September to March and whales from June to late November/early December. At El Pedral Lodge you can enjoy direct contact with nature; the aroma of the sea and the singing of seagulls are sensations perceived as soon as you arrive at the lodge. Once the senses are captivated, you cannot help but be astonished by the vast landscapes of the Patagonian Coast, its beaches covered by huge stones, large streams and towering cliffs. This is a unique spectacle which can be seen while just sitting on the sand, just as good as watching them from a boat, or even better! August & September are the best months to enjoy this show, since it is mating and birthing time. Watching the majestic Southern Right Whales, which can reach 15 m long, from aerial views is another spectacle not to be missed. El Pedral coast is dominated by impressive cliffs of more than 60 m. This, combined with the crystalline waters, result in the privilege of being able to watch them from above, while admiring the horizon and the endless Atlantic Ocean. A magical moment. Killer whales are also frequently seen, although its behavior is difficult to predict. They can be seen from the cliffs or while taking long walks along the coast. November is the best time, since they approach our coasts searching for their prey, the newborn sea elephants. During March and April they hunt sea lions. They can be seen all year long prowling around the coasts. This cast is completed with the steppe fauna, guanacos, foxes, maras and ñandues, and the rural activities, like the sheep shearing. · 220 volts electricity, generated by eolic energy. There is a diesel generator as a backup. We recommend to bring a lantern just in case, since technology can fail in such remote places, leaving us without light for a few hours. Mobile reception is poor, but the lodge is connected by radio to the city of Puerto Madryn and Trelew. Today in the morning you will be picked up and driven to the airport in Trelew for your private domestic flight to Buenos Aires (arrival in the domestic airport). Estimated driving time from El Pedral to Trelew: 1 hour 45 minutes (100km). Estimated flying time from Trelew to Buenos Aires: 2 hours 45 minutes. Arrival in Buenos Aires and transfer to your hotel. One this day you could experience a private sailing through the Delta in Tigre. The history of Tigre dates back to a port on the banks of Las Conchas river, named after the sea shells debris that was abundant in the riverbed. The delta today consists of about 5000 islands and 350 streams and rivers. Or you could spend the afternoon in the posh neighborhood of Recoleta. Apart from the famous cemetery (where Eva Peron is buried), you can visit the beautiful white Basilica Nuestra Señora del Pilar which was built by the Jesuits. Nearby stands the Centro Cultural Recoleta, one of the city’s leading art centres and Buenos Aires Design, a shopping centre filled with design and trends. On the green hills of Plaza Francia, a fair is held every weekend, selling different types of handicraft. Crossing the Libertador Avenue, you can see a brick-red Neoclassical building which is the Museo Nacional de Bellas Artes (National Museum of Fine Arts), including in its collection both European and Argentina art. In the evening, enjoy an exciting tango show at the Faena Hotel + Universe. The Rojo Tango show at the Faena Hotel + Universe, Philippe Starck’s design hotel in Puerto Madero. The ambience and intimate red velvet-lined atmosphere will ensure that you have an unforgettable night as you watch the performers enact their singular tango moves, accompanied by modern singing and costumes . Today in the morning you will leave Buenos Aires city on a private vehicle to Estancia La Bamba in San Antonio de Areco. Estancia La Bamba is ideally located only 120 km from Buenos Aires, close to San Antonio de Areco, in the heart of the Pampa. One of the oldest estancias in Argentina, recently renovated with great care as a boutique hotel, successfully combines luxurious comfort and colonial elegance. The feeling of being welcomed into a private home, into a property steeped in history and tradition makes this hotel a special and timeless place for relaxation. Exquisite cuisine, refined service, gaucho traditions and equestrian sports add to the unique magic of La Bamba. Upon your arrival to the estancia you will be greeted and guided around by La Bamba’s staff. You will be invited to try local “empanadas“ and have a typical Argentine “asado” and share lunch with the polo players (depending on their schedule). After lunch you will be introduced to the history and traditions of the famous Mate. You get to try it too! La Bamba de Areco is proud to offer authentic gaucho traditions such as “mate” tasting. In the afternoon you can relax at the swimming pool, go for a horseback ride accompanied by the gauchos, who will tell you more about their traditional customs. Before having a traditional English tea you will have the possibility to enjoy a folkloric show and see gauchos demonstrating their skills. In the afternoon, return to the city of Buenos Aires. Free day in Buenos Aires to enjoy last-minute shopping. In the afternoon, you will be picked up by your chauffer and taken to the international airport for your flight back home.